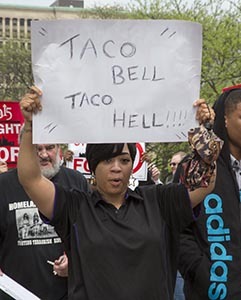 Fast food workers in Detroit staged a one-day strike to press demands for higher wages. Most are now paid at or near the minimum wage of $7.40. They are asking for $15. More than 400 workers walked out at various chains. They were joined at a rally later in the day by hundreds of supporters from the community.